When you think of espresso, Delonghi is a name that is sure to come to mind. For creating top level brewing systems from years, this brand is renowned for its innovation and expertise. This is especially true in the Delonghi ESAM3300, a super-automatic espresso/coffee machine. Utilizing the Direct-to-Brew all in one system, this unit is the epitome of convenience. Additionally, the patented Cappuccino System ensures top quality milk foam that would be the envy of any barista. With this espresso machine at home, any coffee shop beverage is only a press of a button away! Delonghi’s Direct-to-Brew system means that your machine takes care of every step of the beverage making process. The built in grinder provides the perfect ground coffee for any type of coffee or espresso drink. Thirteen separate settings ensure that you find the perfect consistency for your grounds no matter what. A customizable brew system allows you to control the strength and volume of your espresso shots. This means that you get the perfect flavor each and every time. Simply increase the strength for bolder, more aromatic shots, or reduce the strength setting for lighter flavor espresso. The patented Cappuccino System milk frother provides world class milk foam for any type of espresso beverage. Whether you are making lattes, cappuccinos or macchiatos, you are guaranteed the perfect foam every time. This Direct-to-Brew system incorporates three different elements into one compact and elegant design, perfect for any kitchen. This machine is an affordable super automatic espresso machine built with utmost care. Delonghi uses two stainless steel boilers in the ESAM3300. This ensures piping hot water at all times. Unlike systems that use only one boiler, you can brew multiple shots without having to wait for the system to reheat. Additionally, you can steam your milk immediately after pulling your espresso shot. However, if you want to do it right, steam your milk first and pull your shot last. You can keep your milk hot on the cup warmer while brewing your espresso. This ensures that you get the freshest shot of espresso in your beverage, with the full creamy texture still intact. 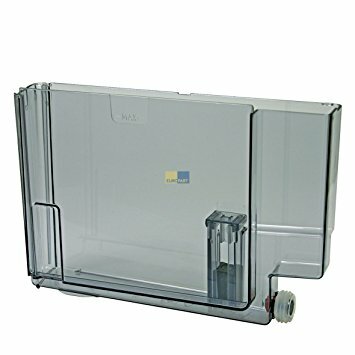 The large capacity 60 ounce water reservoir is perfect for this machine. This allows you to brew multiple beverages without having to worry about running the system dry. Plenty of water is critical for lattes and cappuccinos which require large amounts of steamed milk. Anyone in the know can tell you that steaming milk is what really uses up the water. A large capacity 7 ounce coffee bean hopper will keep you well stocked on your favorite flavor coffee beans. Now you can brew multiple beverages on a single batch of beans, 14 on average. This is particularly helpful on those early mornings when you need to just push a button and go! An auto shut-off feature helps to keep your brewing system safe and energy efficient. Never again worry about whether or not you left the coffee maker on! Backed by a 2 year limited manufacturer’s warranty, this machine is guaranteed inside and out. While most companies have a one year warranty, you have twice the peace of mind with Delonghi. This ensures the quality of the components as well as the assembly itself. Automated cleaning and maintenance programs keep your brewing system at peak performance for years to come. All you have to do is respond to alerts and push the right button at the right time. It doesn’t get easier than that! The built in conical burr grinder ensures fresh ground coffee for every beverage you make. Thirteen grind settings guarantee that you have the perfect grounds for any type of espresso or coffee drink. The patented Cappuccino System provides coffee shop quality milk foam for lattes, cappuccinos or macchiatos. Now you can be a world class barista in the comfort of your own home! Cleaning and maintenance for the Delonghi ESAM3300 is very easy. The durable and sleek plastic housing requires only a quick wipe to remove any splashes or spills. Remove the drip tray to clean off any spills or residue with a quick rinse at the sink. All internal cleaning is automated, making maintenance as easy as the push of a button. Automatic rinsing helps keep the system flushed from any residue from previous beverages. An automatic descaling program helps remove any calcium or mineral deposits from inside the system. These automated cleaning programs ensure that your brewing system will be at peak performance for many years of use. Additionally, the automated nature of these programs keeps cleaning and maintenance completely stress free. The milk wand is the piece that requires the most attention. Make sure you thoroughly wipe off the wand after each and every use. This prevents milk residue from forming on the wand. The heat of the wand will make residue ‘bake on’ quickly. This is why you need to wipe off the wand thoroughly after each use. Keeping a damp cloth nearby is ideal, as this will remove the milk quickly and easily. Also, be sure to blow out some steam after using the wand each time. This will ensure no milk remains in the wand after use. Any milk residue on or in the wand can cause a sour flavor. Thus, keeping the wand clean is critical for ensuring the best tasting beverage every time. The Direct-to-Brew system makes the Delonghi ESAM3300 the most convenient type of brewing system available. Every aspect of beverage making takes place in one compact, elegant machine. While this makes beverage making quick and easy, it does have its drawbacks. 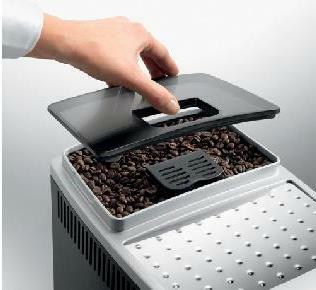 Simply put, the built in coffee grinder is inaccessible for cleaning. This means that you can’t keep the burrs from residue and buildup that occurs over time. Subsequently, you need to try to prevent the buildup from occurring in the first place. Oil rich coffee beans, usually darker roasts, cause oils to build up on the burrs of the grinder. Normally you would clean this off, but in this case you can’t. Thus, the burrs will get ‘gunked up’ over time, reducing their grinding capabilities. The best thing to do is to use oil light coffee beans. These are generally light to medium roast, usually originating in Central America and South America. If you use oil heavy beans, use them sparingly, alternating with dryer beans to help keep the burrs clean. Delonghi’s Direct-to-Brew system guarantees the highest quality coffee beverage every time. It starts with the 13 setting grinder that ensures the perfect coffee grounds right from the start. Anyone who knows coffee understands the importance of fresh ground beans. Whole beans keep their flavor locked in, so grinding fresh enhances the flavor of your coffee exponentially. The strength and volume controls ensure that you get the espresso shot perfect for you. Finally, the world class Cappuccino System milk frother provides coffee shop quality milk foam for any drink. Whether you are making a latte, macchiato or cappuccino, you will get the right foam every time. All in all, the Direct-to-Brew system ensures your beverage is top quality from top to bottom! The Delonghi Magnifica is a perfect all in one espresso beverage making system. Direct-to-Brew innovative technology means all elements are contained in one elegant package. Beverage making is thus seamless and perfect, each and every time. 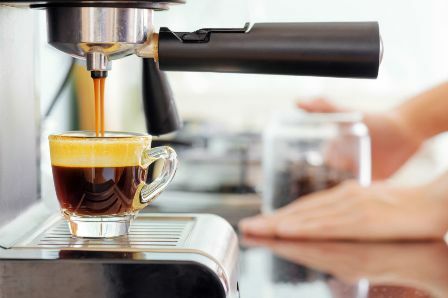 Whether you enjoy an espresso beverage occasionally, or you need one every day, this machine will work for you. The perfect balance of automation and customizability, the Delonghi ESAM3300 is guaranteed to please on every level!